Trading at the India-Bangladesh “Border Haat” in Tripura was disrupted by some people forcing the authorities to ask the police to take action against those who were preventing vendors from entering the border market. “Some people are reportedly preventing license holder vendors to enter the Kamlasagar ‘Border Haat’. I have personally visited the Kamlasagar border market and asked the police to take action against those who are creating trouble,” Additional District Magistrate (ADM) of Sepahijala District Suresh Chandra Das told reporters here on Tuesday. Das, who is the Co-Chairman of the Kamlasagar “Border Haat” management committee, said that out of the 25 vendors from the Indian side, only two sellers had opened their shops on Sunday. “I told the police officials that until fresh names of vendors were approved by the authorities, old license holder vendors will be allowed to do business in the market,” the ADM said. The existing vendors told the media that some people, backed by the ruling parties, were preventing license holder vendors, selected for three years during the previous Left Front government, from carrying out their business since October 28. “As the Indian vendors were not allowed to open their shops, Bangladeshi vendors and buyers were not interested to come to the market,” said an Indian vendor Shyamal Kar. In the “Border Haat”, 25 vendors each from India and Bangladesh are allowed to sell their local produce without any duty or tax. 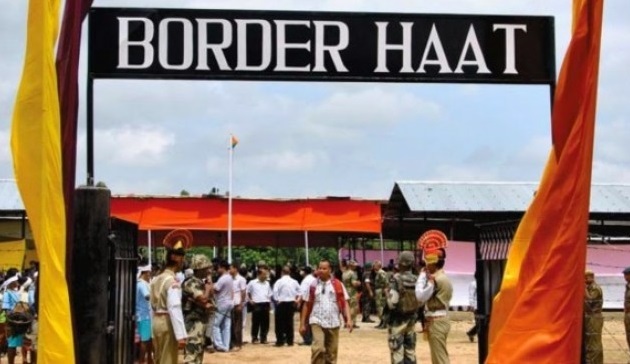 India and Bangladesh have so far set up four “Border Haats” (markets) in Tripura and Meghalaya. Officials of the two countries recently held meetings here to set up six more “Border Haats” along the frontiers with the northeastern states. The states of Tripura, Meghalaya, Mizoram and Assam share a 1,880 km border with Bangladesh.